1 H None No Power Seat 1 H is a standard Business Class seat however, the proximity to the lavatory and galleys may be bothersome. This seat also has limited overhead storage space. 12 A None No Power Seat 12 A is a standard Economy seat that is missing a window. 12 H None No Power Seat 12 H is a standard Economy seat that is missing a window. 24 A None No Power Seat 24 A is a standard Economy seat that may have limited to no recline due to the wall behind. The proximity to the lavatories may be bothersome. 24 B None No Power Seat 24 B is a standard Economy seat that may have limited to no recline due to the wall behind. The proximity to the lavatories may be bothersome. 24 C None No Power Seat 24 C is a standard Economy seat that may have limited to no recline due to the wall behind. The proximity to the lavatories may be bothersome. 24 D None No Power Seat 24 D is a standard Economy seat that may have limited to no recline due to the wall behind. The proximity to the lavatories may be bothersome. 24 E None No Power Seat 24 E is a standard Economy seat that may have limited to no recline due to the wall behind. The proximity to the lavatories may be bothersome. 24 F None No Power Seat 24 F is a standard Economy seat that may have limited to no recline due to the wall behind. The proximity to the lavatories may be bothersome. 24 G None No Power Seat 24 G is a standard Economy seat that may have limited to no recline due to the wall behind. The proximity to the lavatories may be bothersome. 24 H None No Power Seat 24 H is a standard Economy seat that may have limited to no recline due to the wall behind. The proximity to the lavatories may be bothersome. 25 A None No Power Seat 25 A is a standard Economy seat that is often designated as crew seating and may be blocked out when making a reservation. This seat has some extra legroom however, the proximity to the lavatories may be bothersome. The tray table is in the armrest, making the armrest immovable and slightly reducing the seat width. There is no floor storage during takeoff and landing. 25 B None No Power Seat 25 B is a standard Economy seat that is often designated as crew seating and may be blocked out when making a reservation. This seat has some extra legroom however, the proximity to the lavatories may be bothersome. The tray table is in the armrest, making the armrest immovable and slightly reducing the seat width. There is no floor storage during takeoff and landing. 25 C None No Power Seat 25 C is a standard Economy seat that is often designated as crew seating and may be blocked out when making a reservation. This seat has some extra legroom however, the proximity to the lavatories may be bothersome. The tray table is in the armrest, making the armrest immovable and slightly reducing the seat width. There is no floor storage during takeoff and landing. 25 D None No Power Seat 25 D is a standard Economy seat that is often designated as crew seating and may be blocked out when making a reservation. This seat has some extra legroom however, the proximity to the lavatories may be bothersome. The tray table is in the armrest, making the armrest immovable and slightly reducing the seat width. There is no floor storage during takeoff and landing. 25 E None No Power Seat 25 E is a standard Economy seat that is often designated as crew seating and may be blocked out when making a reservation. This seat has some extra legroom however, the proximity to the lavatories may be bothersome. The tray table is in the armrest, making the armrest immovable and slightly reducing the seat width. There is no floor storage during takeoff and landing. 25 F None No Power Seat 25 F is a standard Economy seat that is often designated as crew seating and may be blocked out when making a reservation. This seat has some extra legroom however, the proximity to the lavatories may be bothersome. The tray table is in the armrest, making the armrest immovable and slightly reducing the seat width. There is no floor storage during takeoff and landing. 25 G None No Power Seat 25 G is a standard Economy seat that is often designated as crew seating and may be blocked out when making a reservation. This seat has some extra legroom however, the proximity to the lavatories may be bothersome. The tray table is in the armrest, making the armrest immovable and slightly reducing the seat width. There is no floor storage during takeoff and landing. 25 H None No Power Seat 25 H is a standard Main Cabin Extra seat that is often designated as crew seating and may be blocked out when making a reservation. This seat has some extra legroom however, the proximity to the lavatories may be bothersome. The tray table is in the armrest, making the armrest immovable and slightly reducing the seat width. There is no floor storage during takeoff and landing. 36 C None No Power Seat 36 C is an Economy seat that is often bumped into due to the configuration change from 4 to 3 seats behind. 36 F None No Power Seat 36 F is an Economy seat that is often bumped into due to the configuration change from 4 to 3 seats behind. 37 C None No Power Seat 37 C is an Economy seat where legroom may be restricted due to the misalignment with the seats ahead. The tray table is in the armrest, making the armrest immovable and slightly reducing seat width. 37 D None No Power Seat 37 D is an Economy seat where legroom may be restricted due to the misalignment with the seats ahead. The tray table is in the armrest, making the armrest immovable and slightly reducing seat width. 37 F None No Power Seat 37 F is an Economy seat where legroom may be restricted due to the misalignment with the seats ahead. The tray table is in the armrest, making the armrest immovable and slightly reducing seat width. 40 A None No Power Seat 40 A is a standard Economy seat that may have limited recline. The proximity to the lavatories and galleys may be bothersome. 40 B None No Power Seat 40 B is a standard Economy seat that may have limited recline. The proximity to the lavatories and galleys may be bothersome. 40 C None No Power Seat 40 C is a standard Economy seat however, the proximity to the lavatory may be bothersome. 40 F None No Power Seat 40 F is a standard Economy seat however, the proximity to the lavatory may be bothersome. 40 G None No Power Seat 40 G is a standard Economy seat that may have limited recline. The proximity to the lavatories and galleys may be bothersome. 40 H None No Power Seat 40 H is a standard Economy seat that may have limited recline. The proximity to the lavatories and galleys may be bothersome. 41 C None No Power Seat 41 C is a standard Economy seat that may have limited recline. The proximity to the lavatories and galleys may be bothersome. 41 D None No Power Seat 41 D is a standard Economy seat that may have limited recline. The proximity to the lavatories and galleys may be bothersome. 41 F None No Power Seat 41 F is a standard Economy seat that may have limited recline. The proximity to the lavatories and galleys may be bothersome. 7 C None No Power Seat 7 C is a standard Business Class seat however, the proximity to the lavatory and galleys may be bothersome. 7 H None No Power Seat 7 H is a standard Business Class seat however, the proximity to the lavatory and galleys may be bothersome. 8 A None No Power Seat 8 A is a standard Main Cabin Extra seat that has some extra legroom due to the position of the bulkhead. The proximity to the lavatories and galleys may be bothersome. The tray table is in the armrest, making the armrest immovable and slightly reducing the seat width. There is no floor storage during takeoff and landing. 8 B None No Power Seat 8 B is a standard Main Cabin Extra seat that has some extra legroom due to the position of the bulkhead. The proximity to the lavatories and galleys may be bothersome. The tray table is in the armrest, making the armrest immovable and slightly reducing the seat width. There is no floor storage during takeoff and landing. 8 C None No Power Seat 8 C is a standard Main Cabin Extra seat that has some extra legroom due to the position of the bulkhead. The proximity to the lavatories and galleys may be bothersome. The tray table is in the armrest, making the armrest immovable and slightly reducing the seat width. There is no floor storage during takeoff and landing. 8 D None No Power Seat 8 D is a standard Main Cabin Extra seat that has some extra legroom due to the position of the bulkhead. The proximity to the lavatories and galleys may be bothersome. The tray table is in the armrest, making the armrest immovable and slightly reducing the seat width. There is no floor storage during takeoff and landing. 8 E None No Power Seat 8 E is a standard Main Cabin Extra seat that has some extra legroom due to the position of the bulkhead. The proximity to the lavatories and galleys may be bothersome. The tray table is in the armrest, making the armrest immovable and slightly reducing the seat width. There is no floor storage during takeoff and landing. 8 F None No Power Seat 8 F is a standard Main Cabin Extra seat that has some extra legroom due to the position of the bulkhead. The proximity to the lavatories and galleys may be bothersome. The tray table is in the armrest, making the armrest immovable and slightly reducing the seat width. There is no floor storage during takeoff and landing. 8 G None No Power Seat 8 G is a standard Main Cabin Extra seat that has some extra legroom due to the position of the bulkhead. The proximity to the lavatories and galleys may be bothersome. The tray table is in the armrest, making the armrest immovable and slightly reducing the seat width. There is no floor storage during takeoff and landing. 8 H None No Power Seat 8 H is a standard Main Cabin Extra seat that has some extra legroom due to the position of the bulkhead. The proximity to the lavatories and galleys may be bothersome. The tray table is in the armrest, making the armrest immovable and slightly reducing the seat width. There is no floor storage during takeoff and landing. 9 H None No Power Seat 9 H is a standard Economy seat that is missing a window. Audio Video on Demand (AVOD) is available on this aircraft with a selection of audio programming. Noise cancelling earphones are available to Business Class passengers. There are AC Power and USB ports at every Business seat. Most aircraft feature one power port for every two seats in Economy however, on some aircraft, only USB power is available. This configuration features 28 Business Class open suites and 263 standard Economy Class-style seats in the Main Cabin. This aircraft is used almost exclusively for flights to and from the United States and Europe. In the Main Cabin, beware under-seat storage and legroom is limited for all seats, especially the A,C,F,H seats, due to the presence of equipment boxes. This was the best seat, best flight ever (except for the fabulous return), US to Italy and back. I wish this plane was used for long flights within the US, like to/from Hawaii (if you know it is, tell me! ), although Hawaiian's 330-200 is very close. This seat is marked as not having a window. This was not the case for me, flying this seat on this bird from FCO-CLT a week ago. It not only had a window, but a nice clean one with a great view. Perhaps someone is confusing this with the A330-200? Separately, I have to say that this seat was great. It's a standard economy seat, but offered at least 32 inches of seat pitch, which felt like a ton of room compared to my inbound flight to Italy on Alitalia, where I only had 31 inches of pitch. I'm 6'7'', so I have become pretty adept at sensing pitch without a tape measure. The seat itself was very comfy and well padded with a great adjustable headrest. IFE was very good, only thing is you have to really press the screen hard to get it to respond. FA's were super friendly and routinely circulated with water and drinks. Food was also exceptionally good and abundant in quantity, particularly for coach. We also had individual air vents overhead, which is great. So sad that AA is soon to remove the A330-300 from its fleet! This was one of the best flights across the pond in coach that I have ever had! 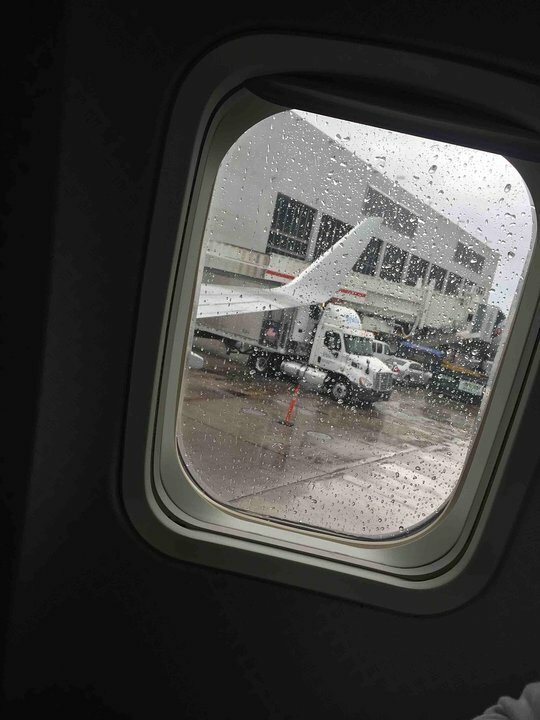 It blew my experience flying Alitalia out of the water, and I'm usually biased against AA! Of the seats you don't have to pay to upgrade to, this is one of the best on the plane, in my opinion. At this point in the plane, there are only three seats in the middle row, which means there is more room between you and the fellow across the aisle. There are also three seats in front of you, so the entertainment monitor is directly in front of you, which is not the case in row 37. Overall, at least on the 330s, American Airlines' entertainment monitors are as crap as crap can be. You have to put all of your weight into pressing the touchscreen, which is very inconveniencing to the person in front of you. I've flown on American A330s four times now, and that has been consistently the case. Obviously a more recent A330 aircraft. Seats on the left have less legroom, while seats on the right have more legroom. Both scenarios require additional fees. But since one mostly sleeps on the way to Europe, we did not mind being a bit more cramped. On the way back we booked seats on the right because the flight lasts a lot longer. Seat for DUB-PHL was in MCE and comfortable, but the space between the seat and the bulkhead was a little wide to lean on for sleeping. The touchscreens are laggy, which was super-annoying as the person behind us was playing a video game and constantly jostling the seat. We finally had to speak to him and he kept doing it. AA needs to remove the games, period. Most people who want games bring their own these days. Cabin crew was attentive and kind. Meals were typical skimpy coach meals (bleh) - basically a Lean Cuisine with a lot of starchy sides. But they did a nice job coming through multiple times with beverages, which made it easier to stay hydrated. 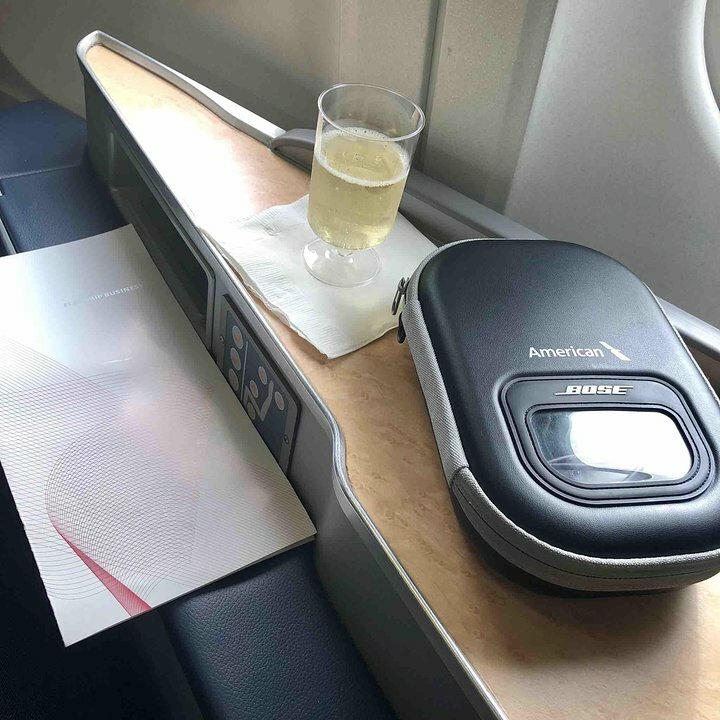 I am generally satisfied with AA business class seating on 777 and 787s. I fly them regularly (at least once a month). However this A330 aircraft which I believe is an older USAIR tail has the most awful business class seating. Extremely uncomfortable in almost all orientations. My suggestion is to avoid any American A330 based aircraft. There is no storage space, except for the over-head compartment. And has a small tray and desk top area. The foot rest does not have its' own separate control and only comes up when you are moving the seat to the recline position. The space was not very private ( especially versus Business Class seat on American Airlines' 77W ), but maybe a bit larger than on the 77W. Flew overnight HNL to PHX. Seat was comfortable both sitting and fully flat. I personally thought the pillow was oversized for the space you have at the head of the bed. Good choice of movies but as previously reported, the in flight entertainment screen can be slow to respond. The system on our flight had to be reset about 45 minute into the flight. One downside to row 6-the lavatories are nearby, but the doors don't close automatically. The light is relatively bright so when someone leaves the lav and does not close the door, it can be annoying. It would be even worse for row 7. I got up twice to close the door. Would be nice if the FA's would notice or AA would fix the problem. Seat was very comfortable with plenty of legroom for 6'2" man. The video monitors were unfortunately of poor quality with slow or no response to touch. Movie selection was good and resolution was fine, once you finally got it to respond. Very nice experience, overall. By comparison, I flew on a BA 747 on outbound leg and seats were miserable. 7H is the last pod in Business Class before the mid-plane galley. It is right up against the toilet bulkhead. The good news is you don't have far to go to the toilet. The bad news is you may be disturbed by those using the toilet and by crew in the galley. Otherwise, a comfortable seat. This plane was fairly new, probably only a year or so old. This was a good seat. In fact, if it hadn't been for the loud Greeks behind me who talked the ENTIRE 11 hour flight from Athens to Philly, this probably would have been one of the best flights I've ever taken. I don't know how you can possibly talk for 11 hours straight at the top of your lungs, but the three of them sure did! We got lots of decent snacks, plus pretty much all the wine you wanted. I was impressed. comfortable and more legroom than I thought. Able to stretch out legs under seat in front and I am nearly 6 feet tall and weigh 15 stone. Flight AA732 CLT-LHR was fantastic - we were seated in row 38, which provided us with plenty of leg room, an entertaining and lively crew and excellent food. The entertainment system worked fine with a good amount of movies available and the close to 8hrs on the brand-new looking A330 went by quickly and smoothly. Thank you so much for a great experience, we will be flying American Airlines more often! Please pass on our compliments to the staff who have made this such an enjoyable experience. I picked 40H seat to be by the window and assuming that noone, unless faced with no other choice, would choose the seat 40G, so close to the toilet. This was a concern for me too but in the end it was a good choice: I had two seats for myself, no-one poking the back of my seat and enjoyed magnificent views. It was a night flight and not completely full so I didn't notice a lot of people going to the toilet. I didn't really pay attention and that's great news, as in fact, I couldn't hear nor smell anything (my big worry!). I was happy with the seat choice. What WAS annoying was the unresponsive touchscreen. I had to tap it so many times and trying so many different spots and angles, I was worried I'd accidentally poke the man in front of me in the head! That made feel good about noone seating behind me. All the more frustrating as there was a wide selection of entertainment. Movies, recent as well as old. TV shows, games, audio cds. The flight CLT-LHR was over in no time. AA flight attendants reminded me of teachers who'd been teaching the same stuff for over 20 years and just didn't care much any more, just going through the motions. What a shame as it really dampens the experience. I have flown on this airplane several times between PHL and Munich over the past few months, all in economy. I have found this plane to be extremely uncomfortable and miserable. There are no main cabin extra seats on the plane, so everything is the same 31" pitch seat that a tall person like me needs a can opener to fit in. The best seats are the bulkhead seats in row 25 and row 8, but you still can't stretch your legs out. My best strategy is to pick an open row and hope it stays open so I can stretch out sideways. There is USB charging at each seat, but do not expect much from the IFE. The touch screen is completely unresponsive to make it impossible to enjoy any entertainment. Not only that, you will get frustrated with the person behind you repeatedly tapping the screen trying to get it to work. Finally, I find it odd that they reserve 4 prime seats for crew use. The exit row seats in row 25 (A,B,G,H) are marked off for crew use, and covered by a curtain during the flight. In a plane where there is a frustratingly low availability of prime seats for elite travelers, I wonder why they would take four of the best ones. CLT-LHR. Had limited choice so risked 25F, it was a mistake. The toilets basically serve all of economy so are busy all the time, that wouldn't be so bad but the light inside is not guarded so act as a floodlight everytime the doors opens. The rest of the plane was no better, it only had 5V USB, but at such a low ampage it could only charge a phone, an Ipad was actively draining when used. The avod screen was also useless, with every selection taking 10-20 presses like some 15 year old resistive screen. All screens had the problem, not just the armrest versions, with the whole plane thumping away on them. No idea how old this plane is, but the cigarette stub panels all over it give a clue, its time it met its maker. Just flew Rome/Phila in August, in economy row 17. Seats are leather, which is nice. Leg room is very limited and cramped. Movie selection is poor., touch monitors were almost impossible to use - not sensitive enough to the touch. Was surprised about the entertainment being so poor, seems like AA has gone downhill since my last trip to Europe last year. The legroom on this seat was really nice. However like any bulkhead seat I couldn't stretch my legs all the way out (I'm 5'10") like you can under normal seats. The seats were new/nice but the AVOD touchscreen barely responded, kind of terrible, that. But good movie selection. I would recommend this seat. 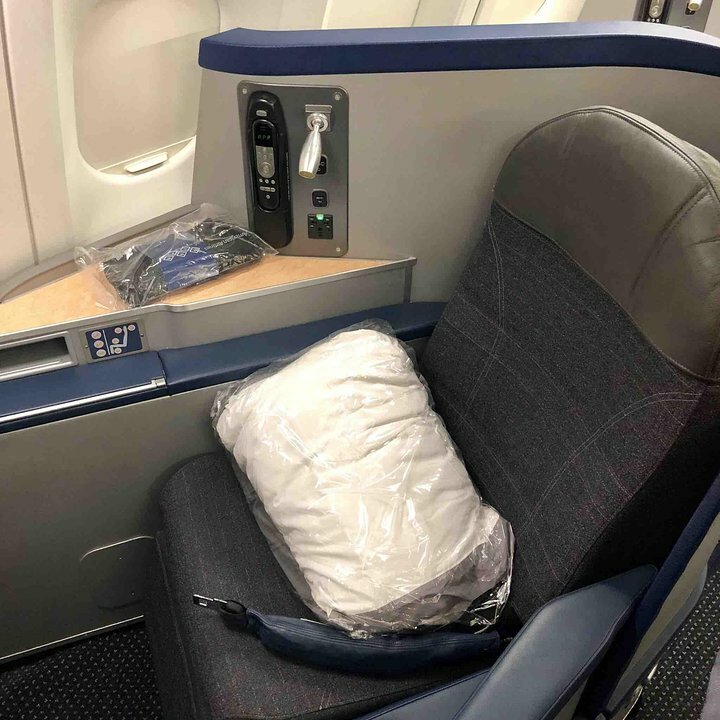 My husband & I just flew in these seats to Rome on 5/11/2016. The ONLY thing they have good about them is extra leg room. 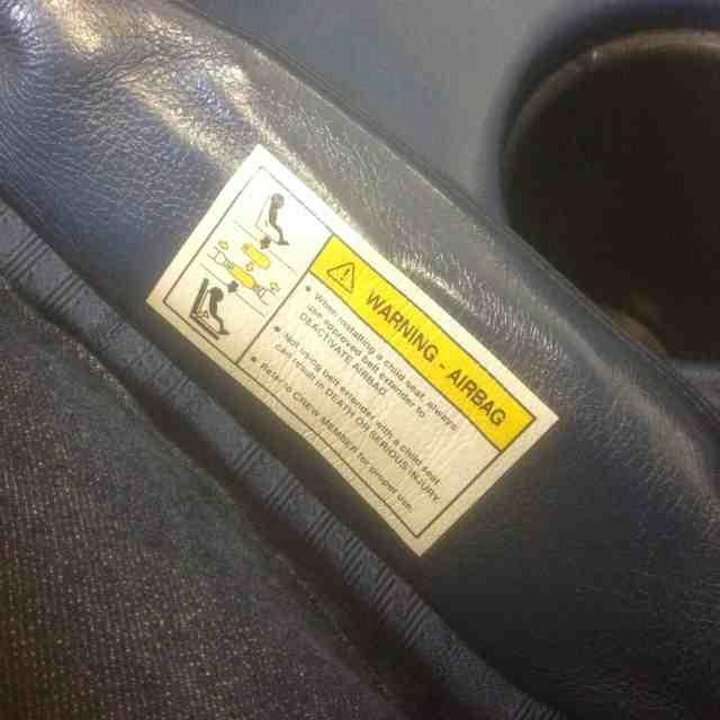 AA should pay you to sit in these! Horrible seats! Almost all of economy uses these bathrooms. All of the forward economy passengers have to use these too. Most of the time there was a queue of 6-12 people hovering right in front of us to use the toilets which had become quite smelly after a couple of hours. The majority of the flight attendants could have cared less about any service & were just in a hurry to scurry off to take a nap or convene in back with each other. Will never fly this plane or flight again. We cannot believe we payed extra to fly in these seats. My partner and I just flew on this aircraft from Rome to Charlotte. This particular aircraft seemed to be "newer" and was in decent shape. The IFE touchscreen was sluggish, and the movie selection was so-so. There were a few current releases of interest. Since the aircraft was only 50% full, there was plenty of room to spread out, and the flight attendants were very responsive. Overall, I thought the flight was pleasant. Seat 30G and 30H provide a nice view of the wing, though it is noisier in the rear section of the plane. Great crew and very comfortable seat for Business Class. Older plane but everything in good working order. While I prefer the new Boeing 777-300 series , this is a comfortable flight. Ex-USAirways plane. USAirways took delivery of these planes starting in 1996, and some of them look like they are almost twenty years old. However, the sometimes threadbare appearance, balky IFE, and minor maintenance issues can be overlooked because they are very comfortable. My flight had no AC power outlets. Not even DC power. No power was a huge disappointment since I wanted to to watch my own movies on my laptop. The crew said the USB ports weren't active, tho I didn't try. I wouldn't pick the bulkhead again. The seats are more uncomfortable with the tray table in the armrest. 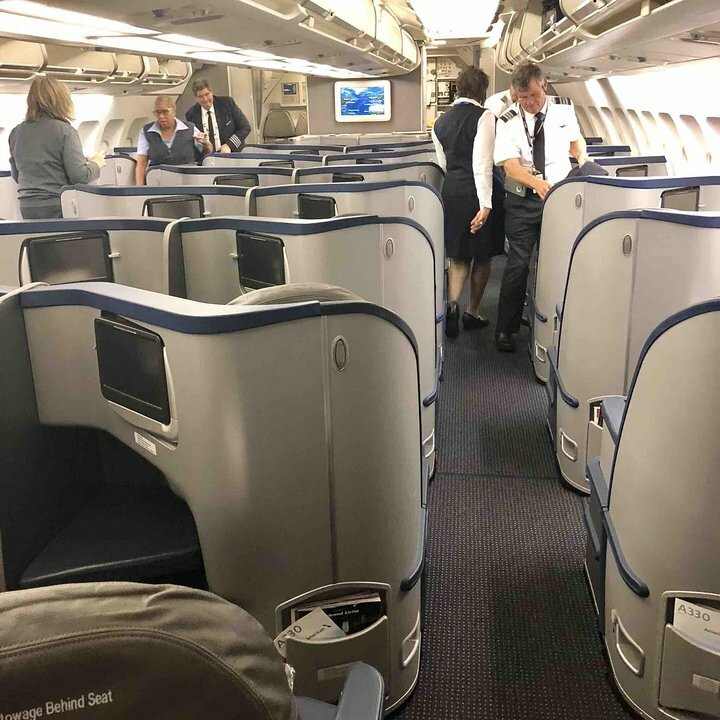 American Airlines flies 1 versions of Airbus A330-300.